Perhaps the best kept secret in the UK – Northumberland’s beaches are something special. Award winning for cleanness and water quality – goes without saying, but where can you build a sandcastle with a vista like this other than Northumberland? Vast, unspoilt clean beaches stretching from Holy Island in the North to Druridge Bay in the South – all the beaches close-by to Budle Bay Croft are spectacular. Some have castles and amenities, others more isolated and less accessible. Whatever your preference, there will be a favourite for your family – and even at peak times, virtually all of the beaches are quiet, so plenty of space to run and be free, or simply sit and contemplate. And there are some wonderful places to sample Northumberland Eats while you explore the beaches and everything else this wondrous county has to offer, with many local chefs taking great pride in using the freshest of local, seasonal ingredients. Many even have special offers to tantalise those taste buds even further. The Holy Island of Lindisfarne – known as the centre of England’s Christian Heritage, is reached along a causeway cut off twice daily by the North Sea tides (Holy Island Safe Crossing Times). A unique and beautiful island, it has a thriving community (all of the Budle Bay Croft ducks are from here) with a picturesque village alongside the striking 16th century Lindisfarne castle and the ancient ruins of the Lindisfarne Priory. Holy Island is also the birthplace to the Lindisfarne Gospels. You can walk around the 4.5 miles of Holy Island in around 3 hours and there are some beautiful sites on your ramble. Ross Beach is not easily accessible as it is about a mile away from where you need to park, through farmland and dunes. However, it is definitely worth the walk and is our family favourite beach. 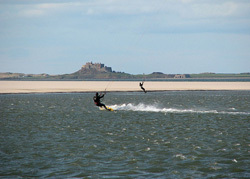 This remote beach between Holy Island and Budle Bay has mile upon mile upon mile of golden sand, with Lindisfarne Castle views to the north and Bamburgh castle to the south. We love getting there at dawn, setting away a disposable BBQ (remember to take all your rubbish) in the dunes to cook our Bamburgh Bangers while watching the sun rise and mist clear between the two castles. The shore and dunes provide sheltered housing for an abundance of wildlife and sometimes access to certain parts of the beach is restricted, for example, at breeding times. However, this won’t limit your enjoyment of the vast expanse of nature. At the north end of the beach is Guile Point, with very distinctive, locally iconic navigation towers used to guide boats to Holy Island harbour. This is the beach that connects to Budle Bay, and forms the golden sand bar across the bay, visible from the entrance into Budle Bay Croft. Rumour has it that some parts of the beach are frequented by nudists! However, in the many years we have enjoyed this beautiful beach, we have yet to see any – despite looking hard each time! The sea is very cold here (you are in Northumberland after all) but is regualarly used for dips, including the baltic times of Boxing Day and New Year’s day! Don’t forget to get some Oysters on your way back to the car to enjoy in your cottage with a glass of fizz! Budle Bay is a beach but not a sandy one like most of the others in the area. Budle Bay is a mud flat estuary home to thousands of wild birds nesting and feeding in the fertile grounds around the 5 mile bay. It is a haven in winter for migratory birds and is as interesting when the tide is out as it is beautiful when the tide is in. You can access Budle Bay from Budle Bay Croft in about 2 minutes. We often walk around the bay to explore the habitats and views, taking a picnic with us. It is best to walk on the verges as the flats can be quite heavy on the feet. Mussels can be found in Budle Bay (we would normally only eat in months with an R in for risk of contamination with harmful algae) and they are delicious cooked that day with white wine and cream, and served with a crusty roll. There are no amenities as such at Budle Bay, but of course you will be staying right there so you shouldn’t need any! However, there is an award winning restaurant next to Budle Bay in the hamlet of Waren Mill (next door to Budle Bay Croft) called Gray’s Restaurant in the Waren House Hotel. It is necessary to book, and unfortunately they do not accept children under 14 (why not use your free baby sitting treat?). However, if you can get a chance to go, the Northumberland Tasting menu has been highly recommended by our guests who have sampled it. 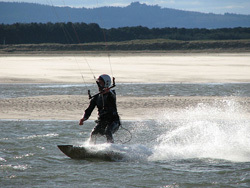 Budle Bay does have water-sports including kite surfing and jet skiing but they can be seasonal/ weather dependent and sometimes not available to protect the natural habitat at breeding times. Water sports can be prearranged by ourselves, or booked locally by yourselves after arrival. Budle Bay is also a great starting point to walk along the beach to Bamburgh when the tide is out – it is about 4 miles along the coastline but as with everywhere round here, the views are breathtaking! 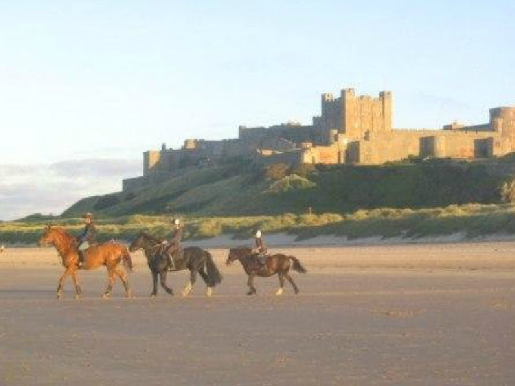 Northumberland has a wide range of attractions, activities and landscapes for you to enjoy. We have highlighted just a few – for more information on these, including opening times and admission prices and offers, please use the relevant links. For more information on an even wider range of things to see and do, we recommend you take a look at http://www.visitnorthumberland.com. Bamburgh Beach sits below the magnificent Bamburgh castle, and offers a long, open expanse of golden sand running almost unbroken between Bamburgh and Seahouses. Prince Charles visited the beach in 2012 and was amazed at it’s beauty, asking his aides why he had never been there before! The beach has sheltering sand dunes and the odd rocky area, great for crab hunting and rock pooling. There is a little burn running onto the beach to the north of the castle (go along The Wynding and park in one of the car parks to be close by). This is a magnet for children of all ages in all seasons, where it is apparently mandatory to create sand dams, castles, villages and battle grounds by diverting the flow around kiddie made structures. As the structures get larger, it seems mums and dads can’t help but to join in in too. Bamburgh beach is great to go to at the end of the day for your daily beach fix after visiting one of the other attractions in the area. You can park right next to it, so when you are all played out and tired, you can simply wrap up in a towel and be in a hot bath at Budle Bay Croft in less than 5 minutes! Bamburgh itself is a charming, traditional, quaint little village steeped in history and well worth visiting. 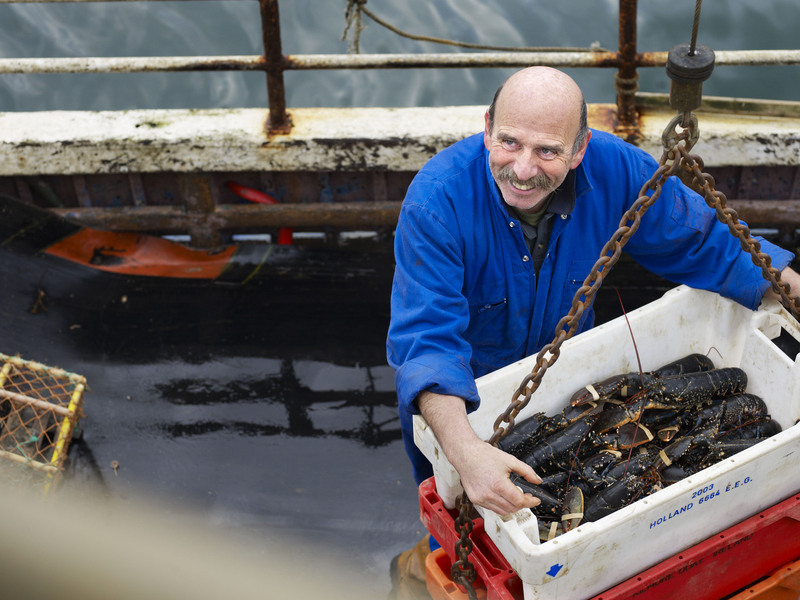 There is a fantastic little butchers called Carter’s – famed for the Bamburgh Banger and a true Rick Stein hero. There are other little cafes in the village for tea, scones and sandwiches, and of course the hotels offer good food – The Castle Inn which serves good sized portions of traditional food and is child friendly. The Victoria Hotel, that has a lighter menu available from the bar and more formal dining in the restaurant, and is very dog friendly; the fabulous and highly rated Potted Lobster; the beautifully refurbished Lord Crewe, that also has a bar served menu and a formal dining option, and is focusing on local produce; plus the Mizen hotel, which is famed for its fish menu, local produce and excellent head chef Martin Underwood – you will need to book. There is a village shop, GS Clark and Son that supplies milk, papers, bread, fruit, vegetables, plants, flowers and staples. Bamburgh also boasts a delectable shop selling traditional sweets and locally made ice creams called The Wyndenwell, two quality gift shops, a wonderful deli, a great little art gallery and an award winning tea room. There is also the historic St Aidan’s Church and the RNLI Grace Darling Museum too. In 1838 Grace Darling courageously rescued sailors from a wrecked steamship, the SS Forfarshire in horrendous conditions on a tiny cobble. It is well worth visiting the free interactive museum for an hour or so to find out more about our local heroine, and to see her final resting place at St. Aidan’s Church, opposite. Seahouses Beach, or rather St. Aidan’s Beach, runs from Bamburgh through to the harbour – a vast arc shape of golden sand with superb views to the Farne Islands. 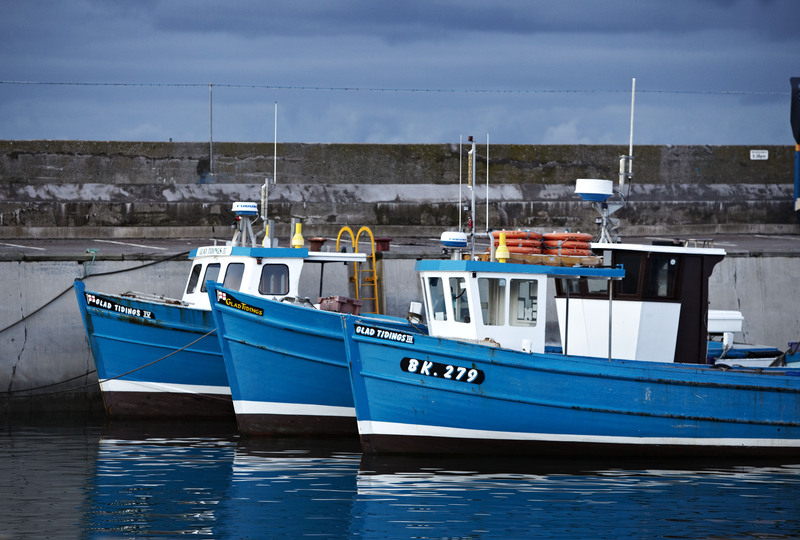 When you arrive in Seahouses, you can enjoy a traditional yet lively coastal village with cafes, fish and chip shops, restaurants, bars, gift shops, arcades and a petrol station. Seahouses is home to The Ocean Club where you have membership to use the gym, pools, sauna and spa (for a small additional fee) as well as access to first class health and beauty treatments. There is also a licensed café serving freshly made food all day. On the sea front you will find The Bunker, a really clean soft play with fantastic fish and chips and a breathtaking view upstairs from their licensed restaurant. They are usually only open until early evening, and you can combine food with a game of crazy golf too! Seahouses has a good range of everyday shops such as The Co-op and Boots the Chemist, newsagents and ice cream shops. It has a barbers, a beauty spa/hairdressers, cafes and coffee shops, and unusual gift suppliers such as the National Trust shop, where proceeds go directly to preserving The Farne Islands. One of our favourites is Drift – with some great local art, gifts, souvenirs, cards and more recently a fantastic range of haberdashery supplies. Seahouses also boasts a great little fruit and veg shop too. It also has a selection of specialist shops such as The Northumbrian Hamper, for locally made gorgeous food and drink treats, and The Swallow Fish Shop, another award winning Rick Stein hero where you can get local oysters, mussels, lobster and crab, all fresh that morning, plus some interesting other fish and fishy treats. 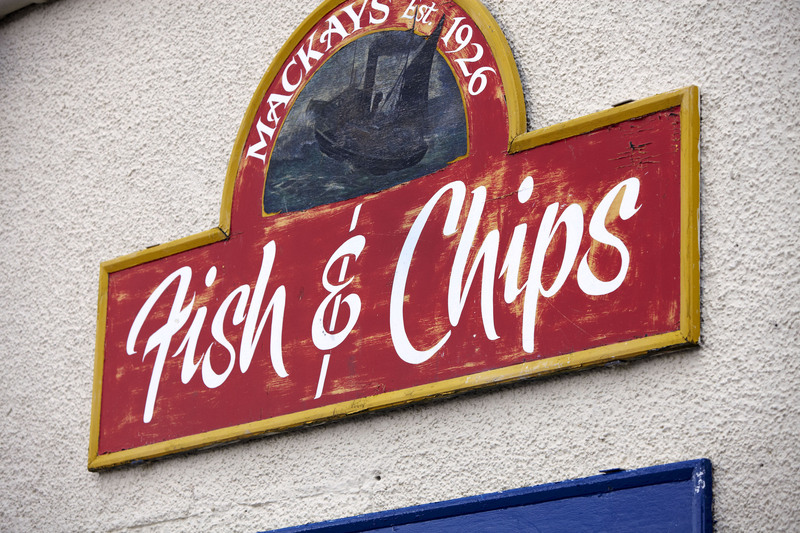 There are a number of pubs in Seahouses, all serving fare, such as the Bamburgh Castle Inn which is both child and dog friendly and The Old Ship, a true fisherman’s bolt hole. There are 2 Indian restaurants, a chinese takeaway and a great little artisan pizzeria called Elan – but I warn you – you will need to book! Boats run trips to The Farne Islands and beyond, including whale and dolphin watching, fishing, and diving with seals – all can be booked from the harbour. Two highly recommended companies include Serenity Boats and Billy Shiel. North Sea fishing, departing from Seahouses, can be preorganised by ourselves, or arranged by yourselves on arrival. There are a number of trip options available, so it doesn’t really matter whether you are an experienced angler or a complete novice. Individual or group bookings are possible. Sea fishing species typically include Ling, Pollock, Coalfish, Cod and Mackerel. Rod hire is possible and all bait, weights and traces can be bought on board the boats. There are also whale and dolphin watching cruises, trips to the Farne Islands, evening cruises and speedboat rides all available from Seahouses. You can also dive to explore the many local wrecks, or even swim with the friendly seals!. 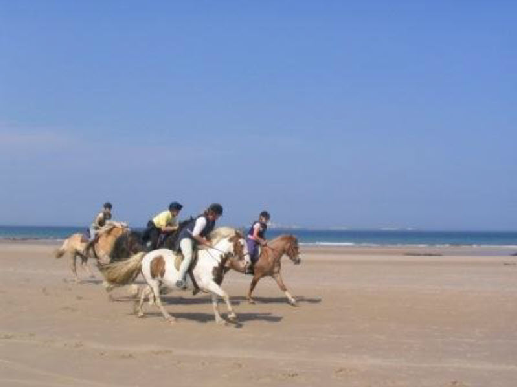 Seahouses also boasts a fantastic riding school called Slate Hall Riding Centre. Lessons and rides can be organised in advance or after you arrive. 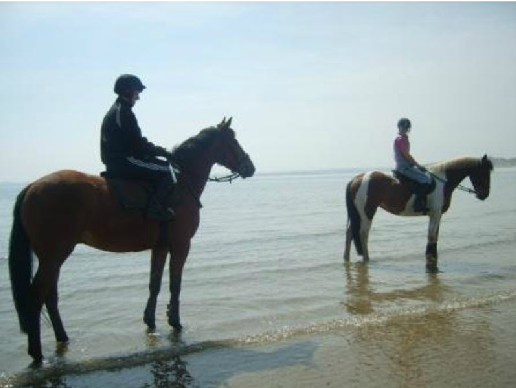 Equipment and horses can be provided, and you can do anything from a taster session for a novice right though to beach hacks and trekking. Our little pony, Jaspar is often at Slate Hall for exercise! These can be all be organised in advance by the owners if required, and we can often secure special discounts. Just let us know what you fancy and they will come back to you with options and availability. Having said all of that, we love nothing more than to get some fish and chips and just sit and watch the comings and goings of the harbour, especially on Life Boat drill days. Here is a lovely little guide from the local children on what to do in their village and neighbouring villages of Bamburgh and Beadnell. It is also worth checking the award winning Seahouses Hub to see if there is a film showing or event on – especially for rainy days. The Farne Islands are rocky outcrops reached by boat from Seahouses and are situated 2-3 miles off the coast from Bamburgh. They form one of Britain’s most important bird sanctuaries being home to tens of thousands of resting puffins, guillemots and kittiwakes, in addition three is a large colony of Atlantic Grey seals. Boat trips circle the islands, and some do land on the islands – a must of you want to see the home of Grace Darling, and the wildlife even closer. Beadnell Beach flows from the ancient harbour, and only west facing port on the east coast of England. 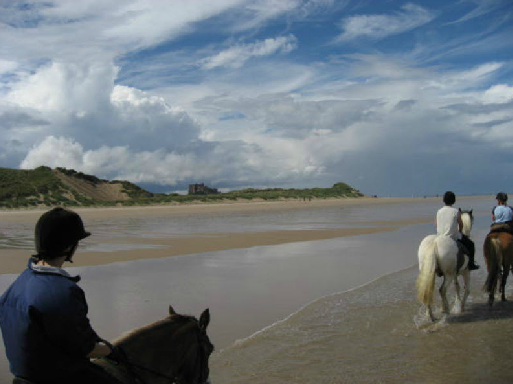 Beadnell is a huge horseshoe shaped beach known locally for a wide range of water sports like kayaking, wind-surfing, kite surfing, dingy sailing, and pony trekking. Some of the dunes are steep and great for rolling down or even sand sledging! Scuba-diving is also popular here due to the myriad of wrecks and treasures found along the Northumbrian coastline. This beach (and village) can get comparatively very busy during school holidays. Beadnell has a few amenities including a village shop and park, and a couple of restaurants, The Craster Arms and the Beadnell Towers. Newton and Low Newton Beaches are easily accessible by car and are both also beautiful beaches. Newton is larger, the other half of the Beadnell Beach horse shoe but much less activity-based than Beadnell. Like Beadnell, the dunes are high so great climbing and rolling fun to be had! There is a popular restaurant called The Joiners Arms that guests tell me is especially child friendly. Low Newton is almost entirely National Trust owned and includes a square right next to the sand where The Ship Inn is located and it is highly recommended by previous guests. They are a micro brewery and often have music in the evenings, but you may need to book. The walk between Beadnell and Newton is very pretty. Don’t be surprised to see seals on (or close to) the shore line (and delicious refreshments at The Joiners Arms or The Ship Inn a just reward)! The lonely coastline stretch between Dunstanburgh and Embleton is dominated by the ruins of Dunstanburgh castle but the delightful walks and panoramic cliff tops from Craster or along Embleton bay are breathtaking. There are a sprinkling of shops, pubs and cafes in Embelton should you need some refreshments such as Eleanor’s Byre. Craster Beach is actually very, very small, but the pretty and traditional fishing village is well worth a visit. The Craster family built the present harbour in 1906 in memory of Captain Cratser who was killed on active service in India in 1904. They still live in the area, at Craster Tower, a fort dating back to 1415, and some of their children are at the same school as ours). 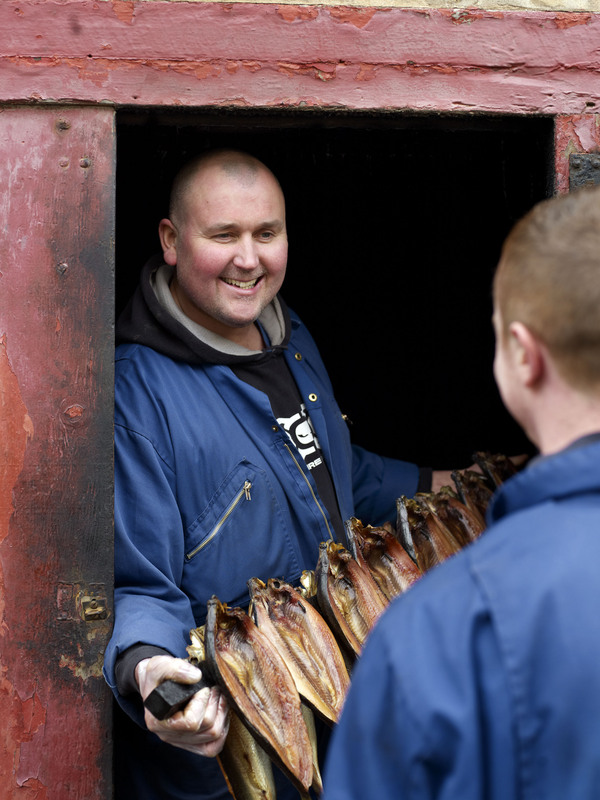 Craster is home to the traditional Craster Kipper, and also boasts a lovely award winning restaurant (the Jolly Fisherman and a great little café, The shoreline, as well as a lovely art gallery by Mick Oxley. You can go bird spotting in the Arnold Memorial Nature Reserve, owned by the Northumberland Wildlife Trust. This green haven attracts a variety of birdlife where rarities including wryneck, icterine and red-breasted flycatchers have been recorded. If you prefer to work up an appetite and walk or cycle along the shoreskimming path to the ruins of Dunstanburgh Castle, whose skeletal outline juts skyward from the sea. Incredible rock formations loom like prehistoric creatures from the coastline. A coastal rock walk from nearby Howick to Cullernose Point takes in the landscape’s sheer geodiversity. A little further south is the hidden cove of Rumbling Kern, once the haunt of whisky smugglers bootlegging their contraband up and down the coastline; today this award-winning, secret beach is worthy of a visit. Sugar Sands are two adjoining sheltered coves often overlooked by the majority of visitors to the area. Drive into Longhouton past St. Peter’s and St.Paul’s Church on the left, turn right following a narrow lane (honesty collection box at gate for the local church) and park on the sand dunes. Boulmer was once the haunt of smugglers and is now one of the few true fishing villages left on the Northumberland Coast. It has no proper harbour and is set in a natural haven where you will see traditional fishing cobbles moored in the water or hauled ashore. The local pub is the Fishing Boat Inn and serves seafood and a view across the sea – but you need to book. Don’t mistake this little place with the massive neighbouring RAF Boulmer! Seaton Point is a very pleasant stretch of sandy beach running between the rocky headland south of Boulmer and a similar headland to the south before reaching Alnmouth. You can park your car on the side of a track leading from the coastal path to the beach. Alnmouth is a picturesque coastal village dating back to 1150 with a quiet sandy beach on the north side of the village. There are good bird watching opportunities along the sand dunes and estuary, and the village itself is quaint with a small array of coffee shops and pubs. Warkworth Beach can be reached by a small road that leads off the coastal route before entering Warkworth village. It takes you down to spectacular sands that run north to Buston Links and Alnmouth Bay. Warkworth itself is a pretty village unspoilt by modern development and the main street is dominated by a medieval keep. A stroll down the street reveals interesting shops, cafes, restaurants and pubs. The Hermitage is a chapel, confessional and dormitory hidden by trees half a mile upstream of the castle, on the north bank of the river Coquet. It can be reached by following the footpath ion the south bank until coming to a boat landing where your can hire a boat to cross. Coquet Island RSPB Reserve lies just one mile off the coast at Amble, and has been a place of actuary since AD684 when St. Cuthbert landed there. It is a safe haven for over 30,000 seabirds, some travelling from Africa to nest on the island. Species include the roseate tern, the UK’s rarest seabird and declining globally. 80 pairs nest here and represent over 90% of the UK population. Thousands of puffins arrive March/April and nest underground, often in old rabbit burrows, each rearing a single puffling. A boat trip around the island can be arranged from Amble. Amble’s also good for fish and chips and delicious ice cream made by Spurelli. Druridge Bay is a long sweeping beach fringed with dunes. Ladyburn Lake in the adjacent Country Park provides facilities for windsurfing and dingy sailing.